Animation retargeting is the process of transferring animations intended for one character onto another. The skeleton structures and their proportions may differ. Retargeting allows you to use the same set of animations on different characters. 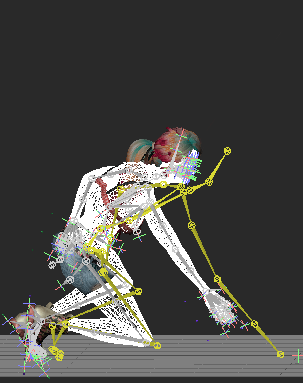 In this article we will retarget motion capture animations created by the Motion Capture Center of the ACCA (The Advanced Computing Center for the Arts and Design), the Ohio State University: http://accad.osu.edu/research/mocap/mocap_data.htm. From the presented on the page we use one of the following sets of animations in BVH format: Female 1, Male 1, Male 2. The target character is Izzy from Reallusion. 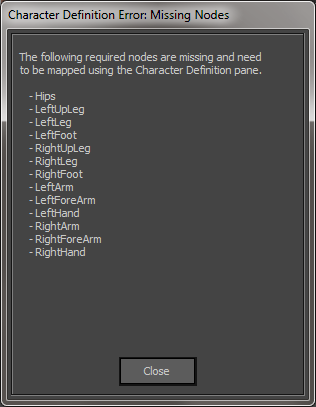 Character is available for download at Unity Asset Store https://www.assetstore.unity3d.com/en/#!/content/50690 . We will use Autodesk MotionBuilder 2015 for retargeting and iClone 3DXchange5 for auxiliary purposes. 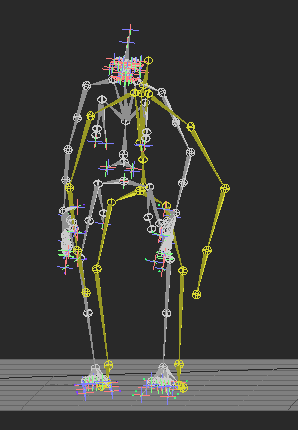 Our goal is to show all the stages of the retargeting process, including mocap import and animation export to BVH. We will also solve problems that will arise. Notice! 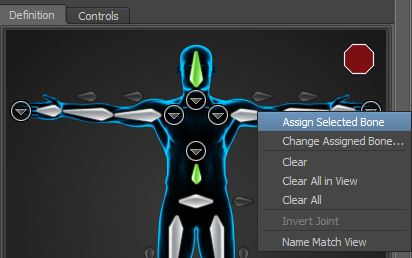 To adjust the T-pose of any of the skeletons, you must remove the [ ] Characterize option from both characters. 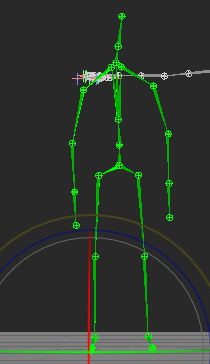 When you import the animations in MotionBuilder (we work with Male2_*.bvh), you can see the following picture. 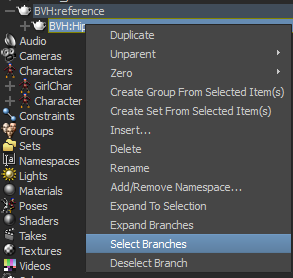 You can correct this "skewness" problem by exporting the animations from iClone 3DXchange to BVH with the "Reset bone offset" flag. Drag-n-drop any of the Male2_*.bvh into iClone 3DXchange. Press Add All to Perform. 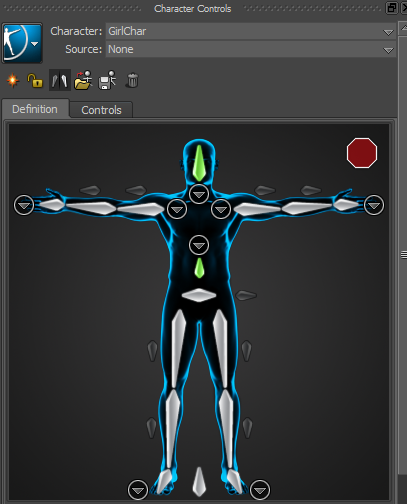 Now we have all the animations in the Perform Editor section. Set [x] Reset Bone Offset and press OK. Note: “File Name” is a prefix. Also, this field cannot be empty. Now we can move on. 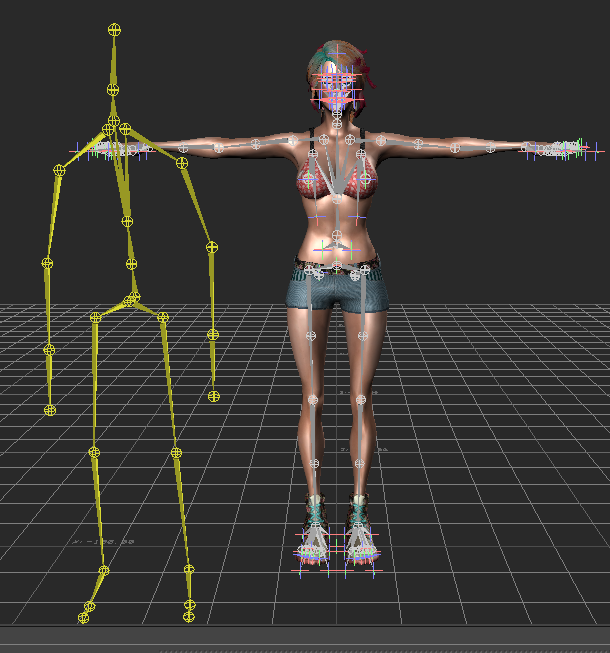 Open Girl.fbx in MotionBuilder (you can download it at Unity Asset Store https://www.assetstore.unity3d.com/en/#!/content/50690). 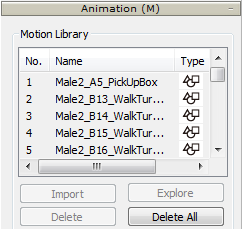 Click File -> Motion File Import…, choose any of the fixed *Male2_*.bvh, for example *Male2_A5_PickUpBox.bvh. Note that we select Create (not Merge). BVH:Hips — Male2 root bone (Hips). 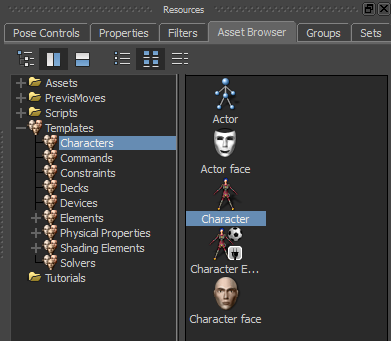 Select Asset Browser Templates / Characters / Character. And drag-n-drop onto the Girl skeleton. 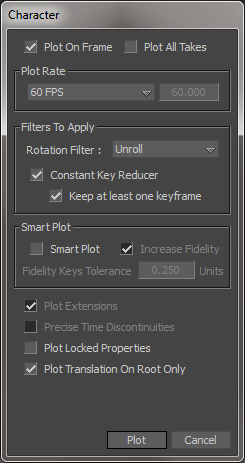 The Characterize tooltip pops up. Click it. Double click on the GirlChar. 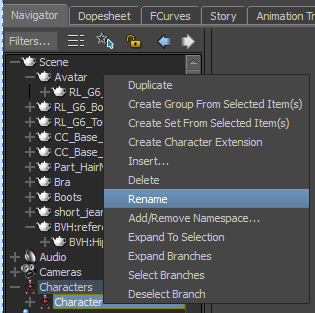 Make sure that Character: GirlChar is selected in Character Controls and the Definition tab is opened. 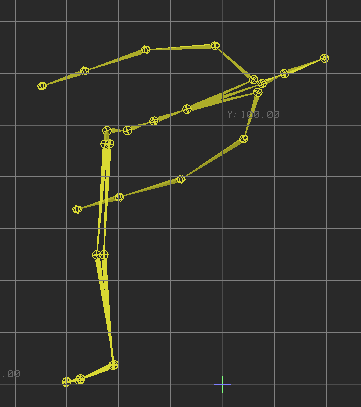 The minimal set to map is all the bones from the "Base (required)" group. Rename the newly created Character to MaleChar. 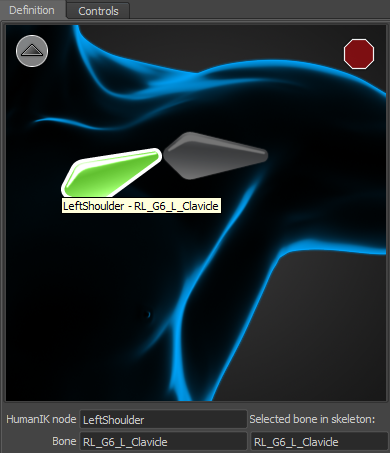 Male2 bone mapping is allright. The thing is its current pose will be considered a T-pose. Turn off [ ] Characterize from MaleChar. Select BVH:Hips, RMB -> Select Branches. Now we need to turn this into a T-pose. 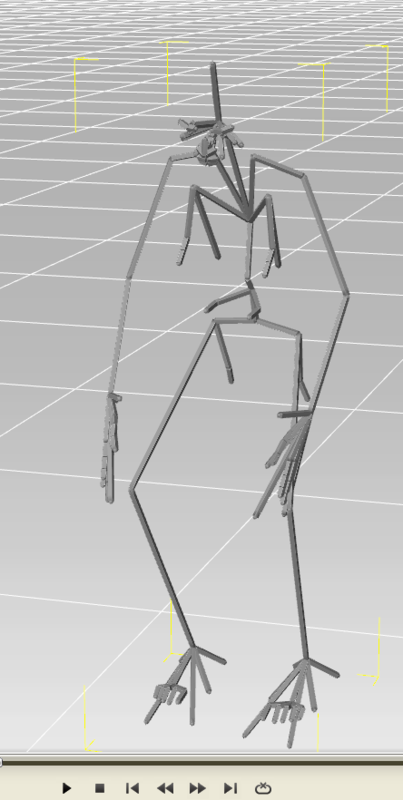 Rotate the bones with the MaleChar [ ] Characterize switched off until we are happy with the T-pose. Turn on MaleChar [x] Characterize. Turn on GirlChar [x] Characterize. Open GirlChar Character Settings and select Input Type: Character, [x] Active; Input Source: MaleChar. Play the animation. 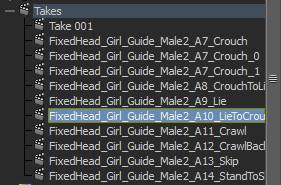 Girl skeleton must reproduce the Male2 animation. 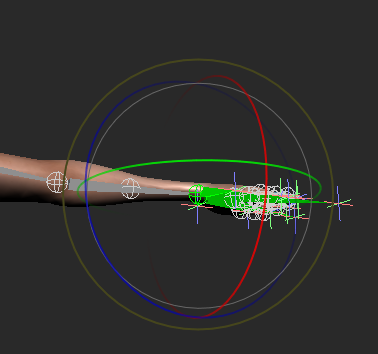 To "bake" the retargeted animation, press Plot Character. The default settings are fine. Check that the plotting was successful. 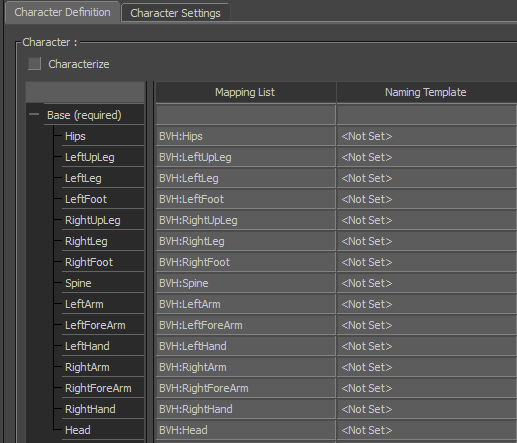 With these settings, the GirlChar character will keep the animation. Select the Hips bone of the Girl character. 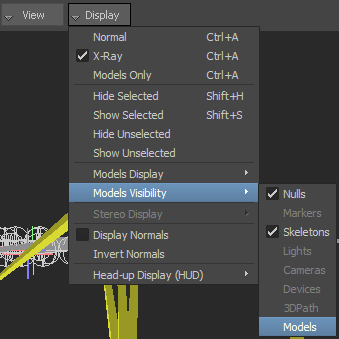 Make sure that "Content: Selected Models and Children" is selected. 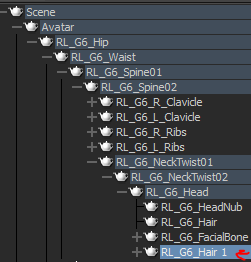 Rename this bone to "RL_G6_Hair_1". 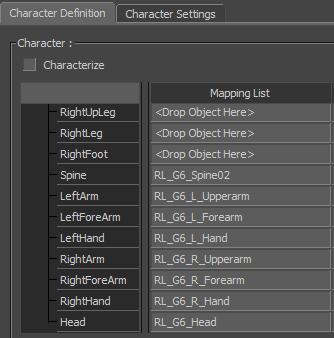 Select the Hips bone and press File -> Motion File Export. The operation should be successful. Open the exported BVH in iClone 3DXchange. Play the animation. It would seem that everything is fine. 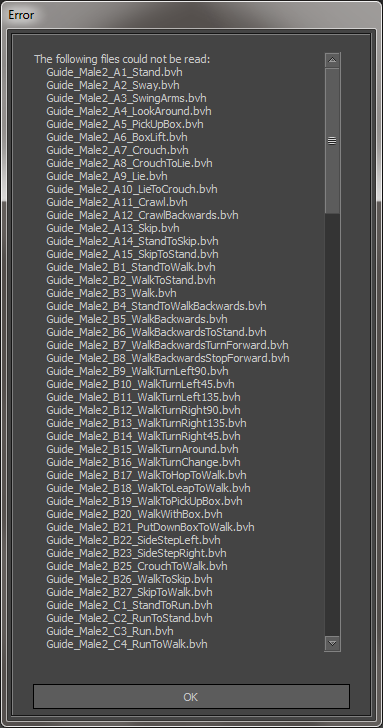 Let's check how MotionBuilder sees this BVH. Create an empty MotionBuilder project. File -> Motion File Import. Import the newly created BVH. Notice something wrong with the head pose. 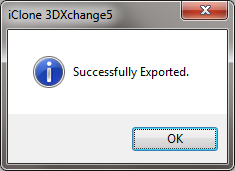 The workaround is to export the BVH from iClone 3DXchange with the [x] Reset Bone Offset flag. 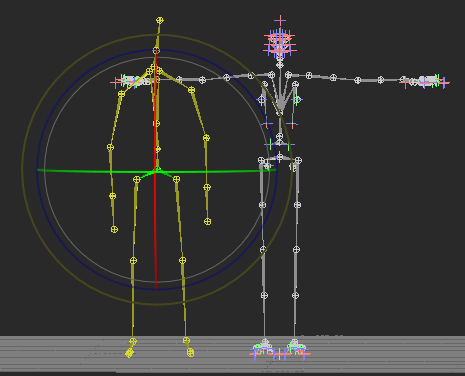 This is how we retargeted a single animation. Now let`s retarget multiple animations at once. Open our main scene with MaleChar and GirlChar. In this case, divide the original set into several parts and import them separately. 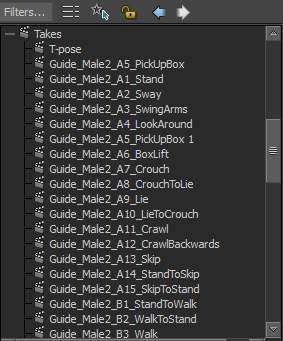 We are fine with two batches, approximately 75 animations each. Next we call Plot Character on the GirlChar. 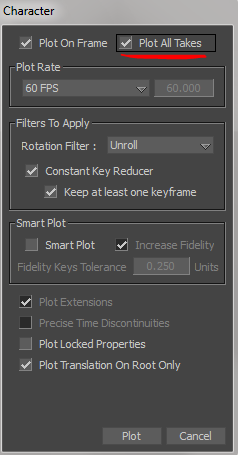 Important checkbox to enable — [x] Plot All Takes. Check the retargeting quality by observing behaviour of the model. Select the root bone (Hips) of the Girl character and File -> Motion File Export. 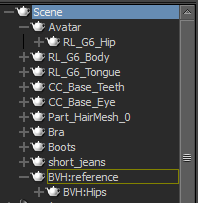 As you might have guessed, the BVH animations been produced must be re-exported with iClone 3DXchange and it`s [x] Reset Bone Offset flag on. Check all the animations (double click on the takes). Now we can use these BVH animations to train the deep neural network.